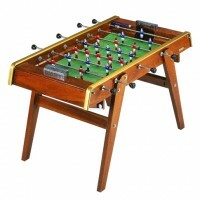 Treat yourself to a Petiot football table! Petiot, one of the most famous football table manufacturers in France, puts its experience and talent at the service of your passion by conceptualising football table that are always more aesthetic and enjoyable. Our selection includes the most beautiful models at the best price. With a Petiot football table, you’re making the choice of a quality football that will not let you down. The Petiot football tables are visually traditional and authentic with a wooden-coloured cabinet, aluminium goals and the famous golden trim rails. Check out our full range and make your own opinion! Behind every Petiot football table is a 95 years old know-how that goes back to 1919, the year the first Petiot atelier was founded. Even then, it was successful! Since then, Petiot’s trademark excellence has been transmitted from father to son. Today, the brand has grown considerably in order to meet the players’ needs and requirements. This success story hasn’t reached its ending yet and saying that the future Petiot football tables will surprise us with their look, playability and longevity is a safe bet!